Tolt Hill Bridge 1834A over the Snoqualmie River on NE Tolt Hill Road, west of the city of Carnation. Photo by Eduardo Calderón. As of Friday, Nov. 16, at approximately 1 p.m., the lane restriction on Tolt Hill Bridge has been lifted. The temporary signals have been removed. November 16, 2018 - Update, 10:20 a.m.
On Friday, Nov. 16, the lane restriction on Tolt Hill Bridge will be lifted. The temporary signals will be removed by 6 p.m.
As of October 23, 2018, the load restriction on Tolt Hill Bridge has been lifted. However, final painting of the steel repair areas is ongoing and weather dependent. The one lane configuration with the temporary signals will continue until all the painting is completed, which is anticipated by mid-November. We will post an update on this webpage and send out a Road Alert email and text as soon as we receive an updated schedule. As of 4 p.m., Friday, August 24, the Tolt Hill Bridge is open to traffic again. Crews have switched sides and will be working on the south side of the bridge while the traffic flows through the north side. A signal is in place 24/7 to alternate the direction of traffic across the bridge. 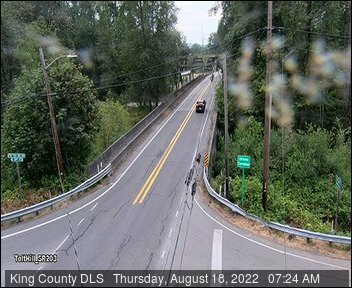 The 24/7 full closure of Tolt Hill Bridge is now tentatively planned to start Wednesday, August 22 at 6 a.m., through Friday, August 24 at 6 p.m., when the bridge will re-open to one lane. Crews will fully close the bridge to move access platforms to the other side of the bridge. Crews are currently painting, which is weather dependent, so schedules may change. We will send an updated Road Alert email/text if the dates change and post an update on this webpage. The 24/7 full closure of Tolt Hill Bridge is now tentatively planned to start Monday, August 20 at 6 a.m., through Wednesday, August 22 at 6 p.m., when the bridge will re-open to one lane. Crews will fully close the bridge to move access platforms to the other side of the bridge. Crews are currently painting, which is weather dependent, so schedules may change. We will send an updated Road Alert email/text if the dates change and post an update on this webpage. The 24/7 full closure of Tolt Hill Bridge is now tentatively planned to start Wednesday, August 15 at 6 a.m., through Friday, August 17 at 5 p.m. Crews will fully close the bridge to move access platforms to the other side of the bridge. Crews are currently painting, which is weather dependent, so schedules may change. We will send an updated Road Alert email/text if the dates change and post an update on this webpage. During the week of August 6, crews will fully close Tolt Hill Bridge to move access platforms to the other side of the bridge. The 24/7 full closure is tentatively planned to start Monday, August 6 at 6 a.m., through Wednesday, August 8 at 5 p.m. We will send an updated Road Alert email/text if the dates change and post an update on this webpage. The construction contractor is installing top splice plates on the bottom chords and upper angles on the top chords of Tolt Hill Bridge, as seen in the photos below. No work will be conducted from July 4-6. Work will resume on Monday, July 9. Please check back to this webpage for more photos and updates on the repair progress. Crew member installing top splice plates on the bottom chords on the Tolt Hill Bridge. Crew installing upper angles on the top chords of the Tolt Hill Bridge. Tolt Hill Bridge 1834A opened for public use on May 30, 2008 and is owned and maintained by King County. It is located over the Snoqualmie River on Northeast Tolt Hill Road west of the City of Carnation. It replaced the original Tolt Hill Bridge 1834A, which was built in 1922 and was located approximately 125 feet upstream. The new bridge is approximately 1,000 feet long and consists of two 300-foot long steel trussed spans, a short approach span on the west side, and three 120-foot long concrete girder spans on the east side of the river. The average daily traffic/ADT of this bridge is approximately 3,000 vehicle trips.The bridge has two travel lanes and two shoulders. It is regularly monitored and inspected. The bridge was built nine years ago, why is the county just now discovering a problem? Following the 2007 collapse of the eight-lane bridge on Interstate 35W in Minnesota, and the federal decision to allow heavier trucks on roadways, the Federal Highway Administration (FHWA) developed new requirements for rating the load that a bridge can carry. The FHWA developed new formulas for analyzing the structural integrity of existing bridges for the purpose of understanding the load that bridges can carry in their current condition. FHWA and the Washington State Department of Transportation (WSDOT) issued the new calculation methodology and required that all state and local bridges to be evaluated by 2022 using the new criteria. As part of the evaluation, agencies are required to review gusset plate connections, which are thick sheets of steel bolting together the structural elements of truss bridges. There are about 36,000 bolts fastening the plates on the two 300-foot long steel trusses of the Tolt Hill Bridge. King County conducts visual inspections of all bridges every two years, and has completed inspections of Tolt Hill Bridge 1834A on that schedule. Rating the load of a bridge is complex work that is performed when a bridge shows signs of stress or deterioration; otherwise load rating is performed on an infrequent basis. There have been no signs of stress or deterioration on the bridge. In any case, this is a new FHWA rating criteria that did not previously exist for evaluating the structural integrity of bridges and key components. The evaluation process is very complicated using the new testing protocol. Initial results did not seem consistent with a relatively new bridge that the county had directed be built to the 2005 bridge construction codes. The county immediately engaged a third party consultant to review our preliminary determinations, and provide even more detailed analysis. The consultant structural engineers agreed with our findings and identified additional concerns. Since this is a new calculation and review process, as soon as we had this information, we reviewed our process with WSDOT bridge engineers, and immediately following, moved to emergency closure. How come this has not come up in routine inspections? This is a new and complex structural engineering calculation designed to identify the weight that the bridge and its connections can carry. King County conducts visual inspections of all bridges every two years, and has completed inspections of Tolt Hill Bridge 1834A on that schedule. Agencies infrequently load rate bridges; this complex work is only needed and performed periodically or if the bridge shows signs of stress or deterioration. There have been no signs of stress or deterioration on the bridge. In any case, this is a new FHWA rating criteria that did not previously exist for evaluating the structural integrity of bridges. Was there any validation of the work performed by the contractor when the bridge was built? The county competitively hired a private design firm to design the bridge and oversee the construction. The county evaluated the qualifications and experience of the firm and key project team staff to ensure that the firm had appropriate licensed and experienced structural and other engineers. It is the professional practice of those licensed engineers to have peer review of their calculations and quality control review of their final design and construction drawings. The design firm is solely responsible for all calculations and design review. Owners do not recalculate the work of hired design firms. During construction, the county does have construction inspectors that compare the constructed bridge to the construction plans developed by the design firm. The bridge was constructed according to the construction plans developed by the private design firm. The issue found was from the design phase and not the construction phase. Calculated values of the various bridge items (gusset plates and bolts) were incorrectly shown on the construction plans. Why is this considered an emergency? Why couldn't work be done incrementally to bring the bridge up to compliance? Based upon the new calculations and using the current standards, there are a couple of key connections between steel beams on the underside of the deck (“cords”) that may not be able to safely support the bridge itself or any additional weight. We are continuing to review the calculations and perform additional analysis, but at this time, the analysis indicates it is not safe to have traffic on the bridge. Was any consideration given to lowering the weight limit of the bridge (to just cars, no trucks) rather than closing it completely? Yes, initially we hoped the results would allow us to load limit the bridge and allow some vehicles and traffic. Based upon recent calculations using the mandated standards, there are a couple of key connections between steel members on the underside of the deck (“cords”) that may not be able to safely support the bridge itself or any additional weight. We are continuing to review the calculations and perform additional analysis, but at this time, the analysis indicates it is not safe to have traffic on the bridge. The structural engineers have enough information at this point to know that there are concerns, mathematically, with structural integrity. We carefully considered whether load limiting was an option at this point. It is not, based upon the standards in the new calculation formulas and what we know at this time. If we learn more that will let us reach a different conclusion, we will make adjustments. How long have you been reviewing this issue? A series of increasingly detailed calculations have been performed over the last couple of weeks. An outside consultant was engaged to review our initial calculations and results, and to look in more detail at the strength of individual gusset plate connections, given that these are new processes and the threshold results were so anomalous. The consultant engineers identified a couple of key gusset plate connections between steel members on the underside of the deck (“cords”) that may not be able to safely support the bridge itself or any additional weight based on the most current standards. Can't you let bicycles and pedestrians use the bridge? Yes. As of July 17, 2017, bikes and pedestrians are allowed on the bridge.